Root Chakra known also as Muladhara chakra is considered as the first stage of spiritual development. This Chakra is associated with safety, security and basic needs of the individual. It creates a solid foundation on which we build our life. Therefore, it is extremely important to balance the root chakra. One of the ways to activate the energy and power of your root chakra is crystal healing. You just need to find crystals with the same vibration frequency. Check our root chakra stones infographic to stay strong, balanced and stabilized. Shungite restores the energetic balance of the body, strengthens the bio field and helps to feel safe and secure. Smoky quarts helps to set and feel connections with one’s body, environment and the whole universe. It cleanses the aura, balances energy flows and brings stability. Hematite is responsible for distribution of energy and personal relationships. It is a stone of grounding and balance. Garnet is associated with loyalty and creativity. This stone helps to control the rise of Kundalini energy. Powerful vibrations of Red jasper charges the Root Chakra, creates strong connections with the world and helps to find emotional stability and strength. Energy of carnelian restores lost confidence and motivation, awakens one’s talents and encourages the connection between inner and outer worlds. 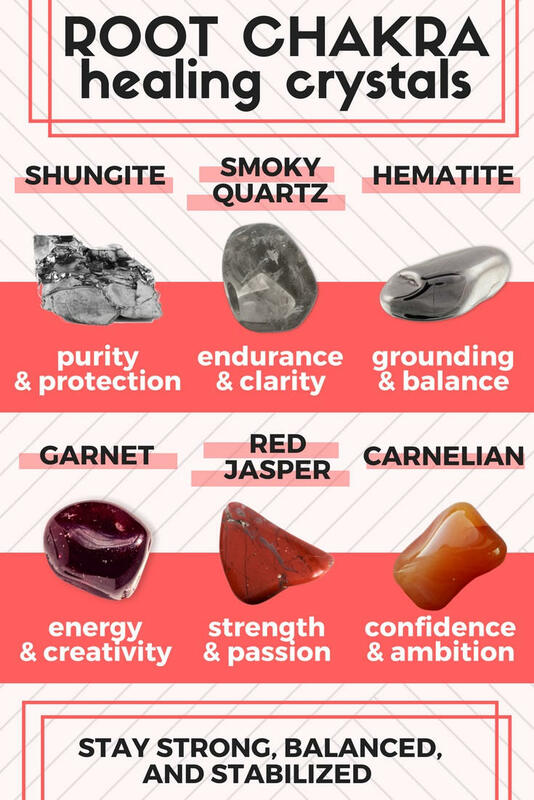 Red and black stones are best of balancing Root chakra influencing the functioning of all the other Chakras and your spiritual development in general.